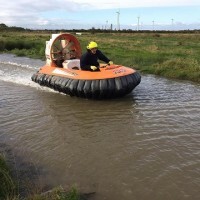 A Hovercraft experience is fun for all of the family, allowing you to experience the thrill of being in control of a hovercraft, and flying solo at approximately 30cm off the ground! Hovercrafting is mostly land based, but some tracks do have stretches of water for you to glide over. Experience the thrill of gliding over land and water on a cushion of air at about 40mph. The sessions range from 1 hour - 3 hours, based on a average group size. Available in various locations throughout the UK.